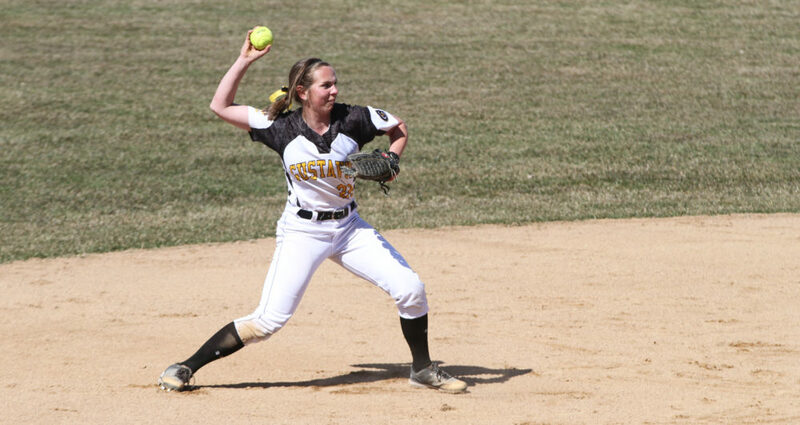 ST. PETER, Minn. – It was a sight for sore eyes Thursday as the Gustavus softball team finally played its first game on the natural playing surface of the Gustie Softball Field. The Gusties hosted Saint Mary’s and ended in a split, losing the first game 3-1 before winning the second 2-1. Gustavus is now 10-22 overall and 6-12 in the MIAC. Saint Mary’s scored a run in the first inning and never trailed. Three scoreless innings passed before the Cardinals added another run in the fifth. The Gusties ended the shutout in the bottom half as Sidney Welp (So., St. Peter, Minn.) bunted home Kim Kurtzweg (Sr., Arlington, Minn.). The Cardinals posted an insurance run in the seventh and held on for the win. Aly Freeman (So., Omaha, Neb.) suffered the loss after five and two-thirds innings. She allowed two earned runs on six hits with three strikeouts and two walks. Emily Webb (Sr., Maple Lake, Minn.) led the team at the plate, going 2-for-3 with a stolen base. The Gusties flipped the script in the nightcap, scoring a run in the first inning and never trailed. Taylor Shortly (Sr., Forest Lake, Minn.) doubled home Webb, who singled to reach base. Freeman took the mound again in game two and cruised through four innings before allowing the Cardinals’ only run in the fifth. The Gusties’ second run of the game came in the fourth frame as Brianna Menssen (So., St. Paul, Minn.) scored on an RBI groundout by Ashley Beise (Jr., Loretto, Minn.). Freeman pitched her third complete game of the season, allowing one run on just three hits and two strikeouts. Webb once again led the offense, going 2-for-3 with a run and a stolen base. Gustavus next faces Augsburg at the University of Northwestern-St Paul at 6 p.m. Friday.